Natalie asked, "What in the world did you eat when you were off dairy while nursing?!?" I cut down my cheese consumption, but the truth is a lot of cheeses contain little to no lactose! You can tell by checking the nutrition facts -- if the sugar is listed at 0 grams, it turns out the cheese doesn't contain lactose. I didn't go hog wild or anything but I kept my cheese eating to a minimum. 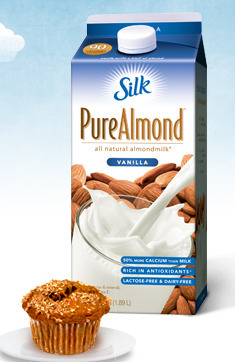 As for milk, I tried all different kinds of non-dairy milks and found Silk's Pure Almond (vanilla) to be the best. Eating it with Frosted Mini-Wheats for breakfast felt kind of wrong because it was so yummy! 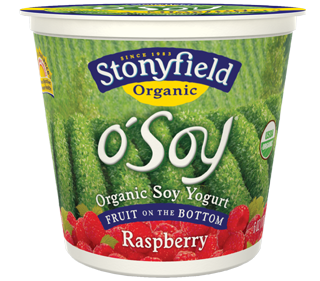 I also enjoyed Stonyfield Farms' O' Soy yogurt when I was dying to eat yogurt. It's thick and creamy and delish. And organic. Always a plus. And surprisingly, not too expensive! Even the evil empire Wal-Mart sells it. I didn't eat any ice cream the entire time, though. Ugh, that was painful. In desperation, I paid and arm and a leg for some coconut milk ice cream at Sprouts and it tasted horrible. I just ate the Dreyers' Fruit Bars as a treat instead. File Transfer asked, "If you, Jenna, could blink your eyes and forever stop someone's heart from beating, who would you choose? Conditions: You absolutely MUST choose someone. And assume that there are no moral or legal ramifications." Voldemort. Does he count, even though he's already dead? And fictional? Ok, ok, I'll bite: Kim Jong Il. I would have picked Osama bin Laden but it looks like someone beat me to it. EmmaB asked, I'm expecting twins. Got any name ideas? Have you ever been to Europe? How many kids do you think you'll have? 1) Congratulations! First, I must know if they are boy-girl, girl-girl or boy-boy twins. I have a twin brother and his name is Joshua. It's kind of fun for twins to have alliterative names (Josh and Jenna), but I've also read some people think it's tacky/cruel. These are all names I love can't use for my own kids for various reasons. So feel free to bestow them upon your own children -- might as well go to good use! 2) I unfortunately have never been to Europe, but there are still places in the U.S. I want to visit first. When I do go to Europe, I'd most like to spend time in the UK and France. Then Italy. Gotta see all those places I learned about in Art History 202! 3) More than two but less than five. The number fluctuates daily depending on the wildness of my children. Creole Wisdom asked, "Do you ever regret marrying so young? (Sorry if that is too personal) Since you live in AZ, do you ever run into other LDS mommy bloggers? There are quite a few in AZ I think. If you could meet 5 blog friends who would you chose to meet and why?" 1) Not too personal at all! The only times I ever regretted marrying young were when others gave me crap for it, which happened for quite some time. Even though I was young (18, for those who don't know), I was ready in every way to be married. I never felt like I missed out the college dating scene, never wanted to live or travel alone, never wanted to be single. All the things I wanted to do and accomplish, I was able to do with Dill. We essentially became real-world adults together and I wouldn't have it any other way. 2) I have actually never run into a LDS mommy blogger here. Surprising! I'm always expecting it to happen, especially when I'm in downtown Mesa or at a thrift store. I do occasionally meet people who read my blog, and that's always a thrill (If you see me out and about, don't be afraid to say "hi!" Unless I'm yelling at one of my kids). A lot of my blog friends and readers are already real-life friends, which is pretty cool. 3) Five blog friends I'd love to meet: Creole Wisdom (of course! ), Alison from She Blogs She Blogs, Sam from Young People in Love, Emmy from Emmy Mom -- One Day at a Time and Brissa from half&half. Jenna, thank you for answered my questions! I always wanted to marry young (I'm 24, am I young still? Not enough to be a "young bride" I digress!) so I'm curious about those who do. I'll have to check out those other links. Have you read "Barefoot in the Kitchen?" She is a darling blogger from Mesa. Also, that yogurt looks good. Dairy is pretty much all I care about in this world. I need large amounts of it daily. Ha. So jealous you have a twin! I have a fake one but I've always wanted to be a twin in real life. My little brother became my fake one because I insisted on it and it stuck. And I got married young too, at 19. Looking back I do wonder what the rush was but whatev. Fun post! Way to NAIL it with Kim Jong Il. p.s. You probably don't remember me but I used to be on babycenter (as annak98) and just started reading your blog for the first time since pre-smush, I think? You're hilarious. And the 30 day challenge is challenging me. Well played. What in the world. i had zero ideas you had a twin brother!? I know this is way late but I've just discovered your blog like a week ago. Love all the Q & A posts. Just FYI I went to middle school and highschool with Alison from sheblogssheblogs and I can say she is a very very kind person!